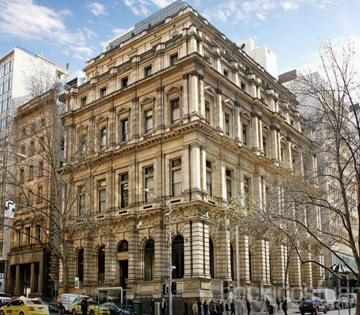 The heritage-listed Treasury on Collins Apartment Hotel is situated in the heart of Melbourne's city centre. Ideal for both corporate and leisure travellers who enjoy the comfort and convenience of apartment-style boutique accommodation with kitchenette and laundry facilities, complimentary business grade wifi internet access and the ultimate city address. The split level Heritage King Loft Apartment with Spa (70m2) blends contemporary style with traditional elegance and offers a very spacious living/dining room area and kitchenette downstairs and a mezzanine bedroom upstairs. Treasury on Collins (ToC Hotel) is a beautiful 19th century landmark building in the most desirable precinct of the Melbourne CBD. It has been refurbished and transformed into an opulent Apartment Hotel offering suites, loft apartments, one and two bedroom serviced apartments. These unique apartments are designed to impress with expansive interiors and all feature a well-appointed kitchenette, washer/dryer, living / dining area (separate in all 1 & 2 bedroom apartments), flat screen television and complimentary Netflix and business grade in room Wi-Fi. Right in the heart of the Melbourne city centre, just a 5 minute walk to Bourke Street Mall, this Apartment Hotel is perfectly located on historical tree-lined Collins Street with easy access to public transport. Trams, buses and taxis pass by the front door and trains are within 300m. A short walk from Treasury on Collins are Flinders Street Station, Southern Cross Station, Direct Factory Outlet (DFO), Queen Victoria Market, Crown Casino, Melbourne Exhibition Centre, Melbourne Aquarium and hundreds of boutique shops, cafes and restaurants.